(CNS): As corruption troubles continue for FIFA the global football body has asked the Swiss authorities to launch a criminal inquiry into the circumstances surrounding the bidding processes, which led to the award of the 2018 and 2022 world cups go to Russia and Qatar. The move,Tuesday, follows days of criticism of FIFA for allegedly covering up its own evidence of corruption in the bidding and raises the prospect that some of the current and former administrators could face criminal charges. 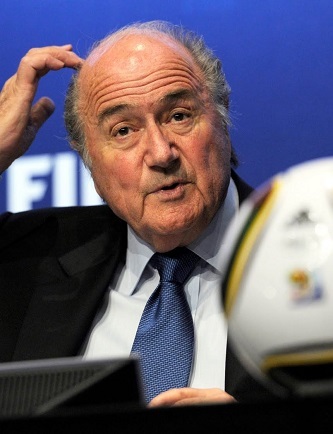 Announcing the request, Sepp Blatter, said internal inquiries had discovered “grounds for suspicion that, in isolated cases, international transfers of assets with connections to Switzerland took place”. The Garcia report will be handed over to the attorney general's office by Eckert but he and Blatter remain adamant the full report cannot be published. Blatter said: "There is no change to judge Eckert's statement that the investigation into the bidding process for the 2018 and 2022 FIFA World Cups is concluded. The matter will now also be looked at by an independent, state body, which shows that FIFA is not opposed to transparency." Asked about the publication of the report, he added: "If FIFA were to publish the report, we would be violating our own association law as well as state law. The people who are demanding in the media and elsewhere that FIFA publish the report are obviously of the opinion that FIFA should or must ignore the law in this regard." While in the UK in September, Cayman’s’ Jeff Webb, the president of CONCACAF and Vice President of FIFA told the British media that it had “a lot of work to do” to rebuild its tarnished reputation in the wake of series of corruption scandals and said the organisation “could have gone further” with its reforms and said he believed Garcia’s report into allegations of corruption during the bidding process should be published in full. The identities of the individuals who have been reported to the attorney general have not been disclosed. Eckert's findings released last week did name two people, both former FIFA ethics committee members, as having contravened rules – Jack Warner from Trinidad and Tobago, who resigned in disgrace in 2011, and Mohamed Bin Hammam, the former Asian confederation president from Qatar who was banned for life by FIFA. It has since been leaked from the reort that a Qatari female bid officer witnessed her superiors offer $1.5million to three FIFA representatives in exchange for votes. Now she has been outed by the leaked report, she has confirmed it again to journalists. "No wrong-doing in the bid" asserts Blatter in his conclusions. Everyone knows this stinks to high heaven, with Blatterin cover-up mode as usual. What does he care, he can do as he likes, whilst getting fabulously wealthy from his position. He makes McKeeva look like an amateur where audacity and graft are concerned. I'm sure Mr. Webb's heart is pure and hands are clean.